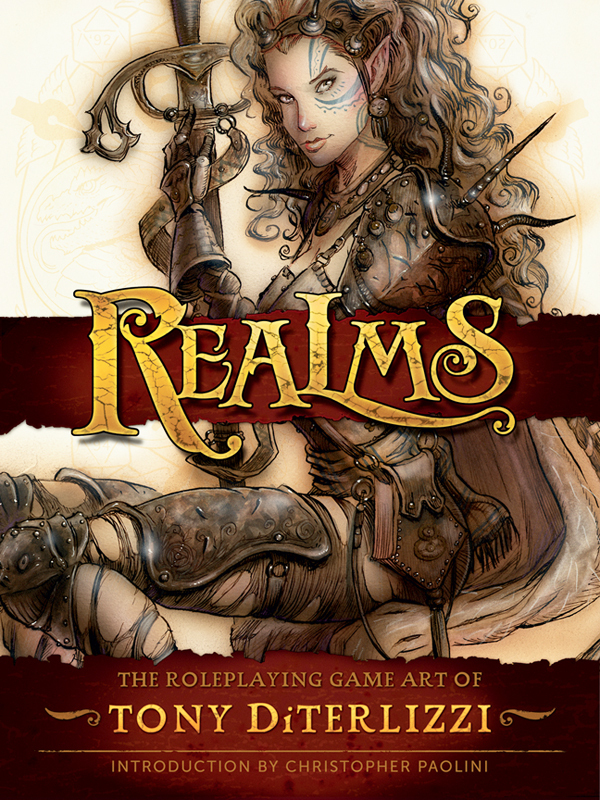 MILWAUKIE, OR; August 14, 2014 – Dark Horse Comics and Kitchen Sink Books are thrilled to announce Realms: The Roleplaying Game Art of Tony DiTerlizzi (June 3, 2015) the first comprehensive collection of game art by the award-winning New York Times bestselling author and illustrator. Known for his distinctive style depicting fantastical creatures, horrific monsters, and courageous heroes, DiTerlizzi’s illustrations reshaped and defined the worlds of Advanced Dungeons and Dragons, Planescape, and Magic: The Gathering in the imaginations of legions of devoted roleplaying gamers during the 1990s, before he transitioned to children’s book creation. Among his most renowned works are the chapter book series The Spiderwick Chronicles, a literary phenomenon which has sold millions of copies and has been translated into 30 languages. In 2008, Spiderwick was adapted into a successful feature film by Paramount and Nickelodeon Pictures. Tony also wrote and illustrated the WondLa trilogy, Ted, Jimmy Zangwow’s Out-of-this-World Moon Pie Adventure and The Spider and the Fly – the picture book for which he received the Caldecott Honor, one of the most prestigious awards in children’s publishing. DiTerlizzi currently has over 12 million books in print worldwide. REALMS will be filled with hundreds of illustrations reproduced from the original art, unpublished sketches, and photographs from DiTerlizzi’s archives. In addition, DiTerlizzi will be creating a number of new paintings exclusively for this edition. Along with commentary by the artist, Christopher Paolini (Eragon) provides the introduction while seminal figures in fantasy – such as Guillermo del Toro, Brom, Jane Yolen, Holly Black, Zeb Cook, Jeff Easley, and Donato Giancola, among others – provide personal appreciations. Realms: The Roleplaying Game Art of Tony DiTerlizzi Full color hardcover, 9×12, 224 pages is available June 3, 2015. Two special deluxe editions of REALMS will also be offered in limited quantities: The “Double Damage” edition features an enclosed signed and numbered print of a new exclusive image produced for REALMS. The very limited “Critical Hit” edition will contain an original DiTerlizzi drawing bound into the book. More details on these exciting deluxe editions will be announced in the coming months.